The mining industry has some catching up to do. When mining financier Robert Friedland took the stage at the World Copper Conference in Chile earlier this year, he outlined the future of mining in a way that brings hope to an industry suffering from a collapse in commodity prices and a society looking for solutions to shift to a low-carbon economy. His presentation included a slide showing the new Tesla Model 3, said to require about 65 kilograms of copper per car, or about three times that of a conventional vehicle. He also showed a slide featuring a fuel cell, which is built with metals such as platinum and palladium. While Friedland is known for aggressively promoting the commodities his companies produce, there’s broad consensus that these and other metals and minerals will play a significant role in the transition to a low-carbon economy. Copper, aluminum, lithium, rare earth metals with names such as neodymium and lanthanum – and even metallurgical coal, used to make steel – are needed to build electric vehicles, solar panels and wind turbines. This is infrastructure the world is counting on to meet the growing demand for renewable energy to help combat climate change. The timing is right for the mining industry to find new sources for its products given slowing economic growth in China, the country that has driven much of the demand for metals and minerals in recent decades through its massive industrial expansion. But just because the products that miners produce are badly needed to help build a low-carbon future doesn’t mean society will turn a blind eye to the disruption caused by mining operations. The industry has been battered by concerns from communities, governments – and increasingly investors – over the environmental and societal impacts of carving up the earth to extract metals and minerals. Failure to address environmental concerns has led to costly delays and production disruptions at operations around the world. Mining companies are well aware of the problems with their business, and many are working to increase their social licence to operate and reduce risk. But progress is considered slow across the industry as a whole. The current economic woes are seen as a poor excuse, particularly as the low-carbon future gains greater credibility. “Mining needs to be performed in a way that is radically different to what it is today,” says Peter Bryant, a partner at consulting firm Clareo and cofounder of KIN Catalyst: Mining Company of the Future, a group of global mining stakeholders looking to build a new vision for the sector. That includes adopting new technologies to reduce the industry’s environmental footprint, working more closely with communities to get buy-in on projects, and finding better ways to survive the boost-bust commodity cycles that threaten to derail sustainability efforts. “It’s a matter of survival,” Bryant says. Like most industries, a major driver of change in mining will be from new technologies that disrupt traditional operations, making them more efficient and less wasteful and energy intensive. That means more machines, and fewer boots on the ground, literally. Some of the world’s largest miners, such as Rio Tinto and BHP Billiton, have already started using driverless trucks and automated drills to extract and move metals, touting their increased efficiency and productivity. More miners are also looking at renewable energy, such as wind and solar, to power operations, as well as using batteries to replace emission-heavy diesel-power systems. The next stage of technology includes a growing use of big data, GPS and remote sensing to power mining operations. 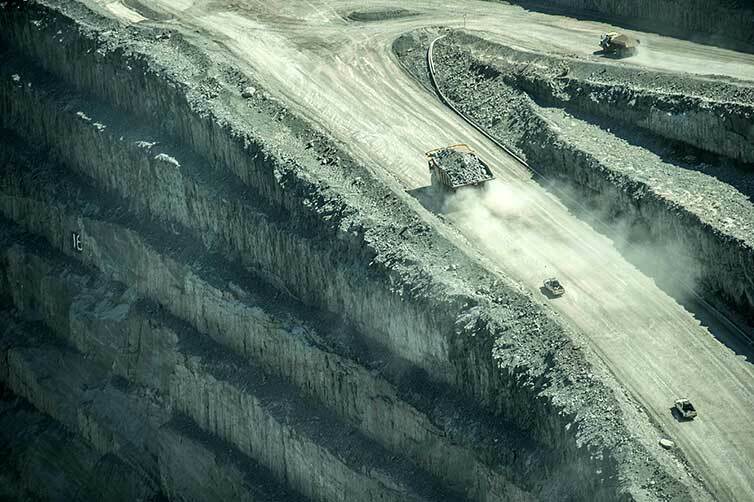 An example is Goldcorp’s Éléonore mine in Quebec, which opened last summer, and has full underground Wi-Fi access, allowing the company to track equipment and people in real time. Goldcorp also says its ventilation on-demand system in the mine reduces energy costs between $1.5 and $2.5 million each year. More miners are also looking into the use of robotic continuous mining systems, which use computer-controlled machines to claw through the earth to extract minerals, replacing traditional mining shovels. The materials are then transported to the mine processing facility by a conveyer, instead of energy-intensive dump trucks that are empty half the time, on the leg back to the pit for a refill. Robotic systems also allow miners to dig in hazardous environments, which improves the safety for workers. Operational changes like these can lead to a dramatic reduction in the size of equipment used in a mining operation, while also reducing its overall environmental footprint, says Jan Kwak, managing director of mining and mineral processing at Hatch, a Mississauga, Ontario-based engineering, project and construction management services company with projects worldwide. Hatch is working on a number of projects and studies to dramatically reduce waste, energy and water use in mining operations in the future. The goal is to help miners increase value from their businesses, while also meeting increasingly strict environmental standards. “It requires a change in technology, change in the business processes and change in the culture inside companies. You need all three to be working to get where you’re going,” Kwak says. That may sound like blue-sky thinking, but Kwak believes it can happen. “You just have to think about your mining problem in a different way,” he says. 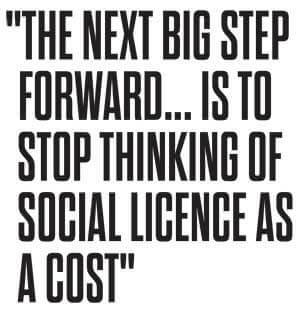 “The next big step forward, to move into a new era, is to stop thinking of social licence as a cost and figure out how to generate value in the environmental and social realm as you do your mining operations. Mining in the future will also involve less tension between companies and communities – at least that’s the goal. More peace would benefit companies, who lose money from project delays, as well as communities, whose economies can prosper from the jobs and investment that mining operations bring. A 2014 study done by Harvard University and the University of Queensland shows projects valued at between $3 billion and $5 billion (U.S.) could lose up to $20 million per week in delayed production costs. “Social risk is a legitimate business risk,” says Jocelyn Fraser, an adjunct professor at UBC’s Sauder School of Business and a PhD candidate in mining engineering. She cites growing incidents of conflict, in both developing and developed countries, as proof of the dissatisfaction with the current model of resource extraction. It can also flare up at any stage of the mining cycle, from exploration through to production and the closure of a mine. Miners are quickly realizing that traditional ways of giving back to the community, by writing cheques to build schools and hospitals, are no longer enough to generate long-term goodwill. What’s needed instead is long-term planning of how the mine will empower the community and minimize environmental damage while it’s operating and long after it shuts down. “Miners are good planners. They can help communities with their needs,” Fraser says. Examples today include Anglo American’s eMalahleni Water Reclamation Plant in South Africa, which treats mine water so that it meets drinking water standards and then makes it available to the local municipality. At its Quellaveco copper project in Peru, the London-based company also plans to build a dam to serve both the mining project, and the local community and agricultural industry. Many Canadian mining companies have also struck agreements with First Nations to directly benefit from the mine, through royalties, revenue sharing and employment. Fraser says more miners need to change their business models to make social and environmental responsibility part of their strategic business objective. Practically speaking, that means building teams where social scientists work alongside engineers to build and run mines. “It would transform corporate social responsibility from sunk cost … to being essentially an income-generating strategy,” Fraser says. While Fraser believes it’s a realistic goal, she worries the prolonged industry downturn could slow progress in the near term. Unless companies start to treat sustainability as a way to generate income, it will always be first on the chopping block, she says. Miners are spending “serious time and effort” to address social and environmental concerns, says Richard Ross, program director and Inmet chair in global mining management at Schulich School of Business at York University in Toronto. Still, he says there’s an ongoing squeeze between communities and governments calling for better practices and investors looking for higher profits and returns. “Finding that right balance between various stakeholders is the single biggest challenge any mining company CEO is dealing with today,” says Ross. Part of the solution he sees is a restructuring of the industry to better withstand the wild economic swings that, when times are tough, can deter progress around environmental and social change. “How do we as an industry create a sustainable model that isn’t so reactive to the cycle? To me, that’s the fundamental issue,” Ross says. One solution to help even out supply and demand is for the mining industry to get deeper involved in the “circular economy,” says Lauren Joseph, the WEF’s community lead for mining and metals industries and global leadership fellow. In fact, she says, mining customers and end users increasingly expect it. The circular economy is where products manufactured from raw materials are repaired, reused, returned and recycled, instead of thrown into landfills. For the mining industry, that includes further reducing raw materials in the mining process, reusing resources such as water and waste and recycling water and metal products, including accommodating higher rates of scrap. The transition will reduce the environmental impact of products across their life cycles, and help miners build better relationships with suppliers, customers and consumers. That, in turn, could help them match production more closely to demand, Joseph says. “The downstream pressure [from end users] could create more incentive for upstream players [the miners] to think about it more seriously so they can capture some of the value,” she says. New players are entering the metal recycling market to capitalize on the trend, creating new forms of competition for miners. One example is BlueOak Resources, a startup that collects e-waste from the technology supply chain and turns it into rare earths and other metals used in alternative energy technologies such as wind turbines and hybrid cars. 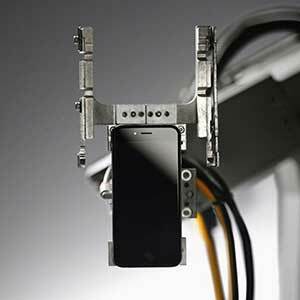 Apple also recently introduced “Liam,” a robot that rips apart its old iPhones, stripping out metals such as nickel, aluminum, copper, cobalt and tungsten, which can be reused in other products. Joseph predicts more miners will partner with companies like Apple and Tesla, as the circular economy expands and deepens. “More and more we will see successful companies engaging more broadly across different customers’ industries to be part of the global system, and really positioning themselves in a stronger way so that they’re part of how the systems evolve,” Joseph says. Bryant of the KIN Catalyst initiative also sees miners partnering with end users to help build more sustainable business models. “The mining company of the future, the smart ones, will be very engaged with the customer and move up the value chain,” he says. The mining industry may not be top of mind for its groundbreaking technology, rapid change or consumer engagement. Still, the industry is awaking to society’s reliance on its people and products to help transition to a low-carbon world. As the expectations grow more intense, Bryant predicts the mining company of the future will be much more responsible, driven by technological breakthroughs and societal pressure to do the right thing for communities and the environment. They’ll also do it to sustain their own business models. “It’s a very different company, different capabilities than what’s out there today,” Bryant says of the future of mining.